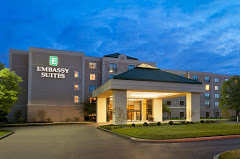 **Full breakfast and (2) hour-long nightly receptions are included in your room rate. Transportation: FREE shuttle to and from airport. From PHL airport to hotel: call the hotel directly 215-365-4500 to inform us of your arrival and the Terminal letter; then proceed outside to Zone 4 for Hotel Shuttles. From hotel to PHL airport: 24/7 Hotel Shuttle will take guest(s) to the airport on the hour and half hour, on a first come basis.